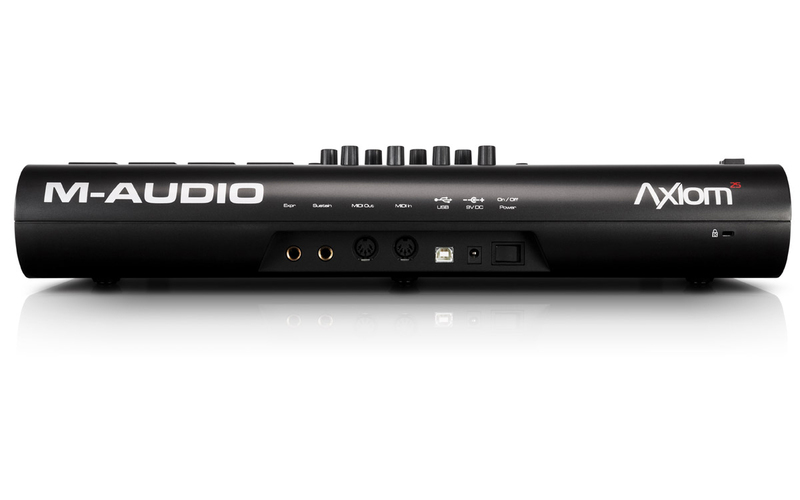 The compact M-Audio® Axiom® 25 mobile controller combines all the production power and performance you need to get the most from your music software and MIDI gear. More than just a “data entry” controller, the Axiom 25 features piano-style, semi-weighted keys for a musically satisfying playing experience—yet it’s small enough to fit in a backpack. Large dynamic trigger pads make it easy to program beats and trigger one-shot samples—while the encoder knobs and buttons deliver complete real-time control over your software. DirectLink mode provides easy, automatic access to common DAW functions including transport, mixer, track pan, and virtual instrument parameters—no complicated setup required. The Axiom 25 controller even features a sleek, angled top panel for easy viewing in any environment. 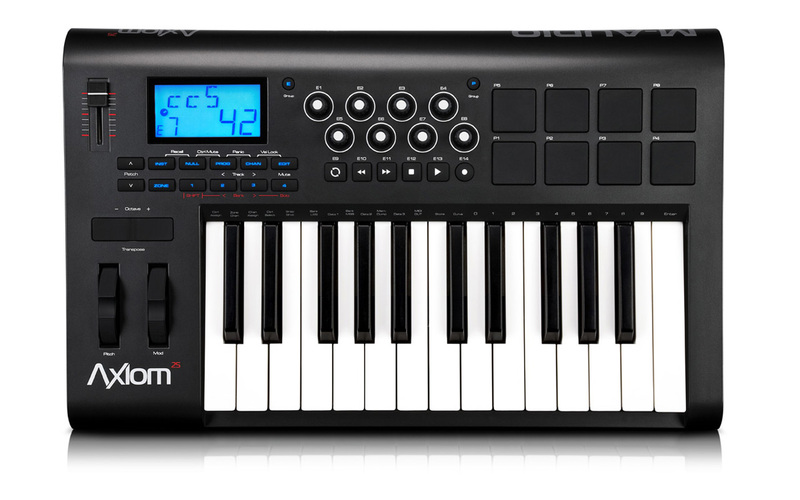 Direct LinkBuilding on the best-selling MIDI keyboard controllers of all time**, the updated Axiom series features DirectLink, which automatically maps the onboard controls to common parameters in DAWs* like Pro Tools®, Logic, Cubase, Live, and Reason. Take control over your software studio—directly from the keyboard. Use the fader and encoder knobs to fine-tune the mix. Easily navigate through sessions using the Transport buttons. Interfacing a MIDI controller with your software doesn’t get any easier than this. When inspiration strikes, you need a keyboard controller that can translate ideas into killer tracks. That’s why Axiom 25 is equipped with an ultra-expressive semi-weighted keyboard and eight Trigger Finger® pads for programming beats with incredible feel. Automatically map Axiom 25 to your DAW with DirectLink—or delve deeper by assigning the pads, encoders, and fader to whatever controls you wish. Each controller can map to just about any MIDI message available, along with independent channel addressing for each. The possibilities are as endless as your imagination. With other MIDI keyboards, assigning controls to virtual instruments has never been easy. Now thanks to the Axiom 25 controller’s new Instrument mode, a single button instantly maps the fader, buttons, and encoders to any virtual instrument inside your DirectLink-compatible host*. You get direct access to synthesis parameters such as filter cutoff, LFO rate, and envelope settings—without having to manually configure anything. It’s almost like turning Axiom 25 into a dedicated hardware synth. Whether you’re on stage or in the studio, your keyboard controller should fuel your creativity—providing all the right information and controls at your fingertips. That’s why we designed Axiom 25 with a sleek angled top panel for easier viewing of the display and improved ergonomics. Smooth rotary encoders deliver precise, continuously variable parameter changes, giving you a hands-on feel for the mix. The backlit LCD screen provides informative feedback from DAW hosts, including on-screen display of parameters, settings, and track/VI names. It all adds up to intuitive control over your MIDI software and hardware. The Axiom series is extremely compact and lightweight and all models are powered directly from your computer’s USB bus. Choose the size that’s best for your needs, then take your music anywhere you want to go.